Very excited about our new U19 Squad. 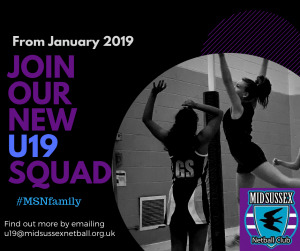 Please email u19@midsussexnetballclub.org.uk for more info. Led by one of our performance coaches training is on Monday evenings indoors in Burgess Hill. Players currently in school years 11, 12, 13 and first-year uni (if U19 on 31/08/19) are eligible to join & invited to attend.